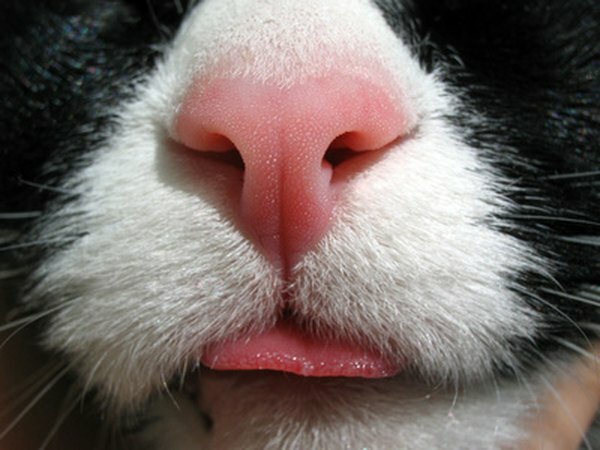 A cool, wet nose can denote overall good health in cats, but it's far from conclusive. Cats typically have cool, wet noses. Some pet owners believe a warm, dry nose denotes a sick cat, but, in actuality, a cat's nose temperature and moistness varies every day. Drastic changes, however, can alert you to other symptoms and potential health issues. A cat's nose is typically moist, but a dry nose doesn't necessarily denote health problems. Cat saliva, for instance, can temporarily dry a nose. As such, recently self- or peer-groomed cats often have bone-dry sniffers. "I've seen perfectly healthy cats that just happen to have a dry nose," Dr. Arnold Plotnick says in an article on CatChannel.com, the website for Cat Fancy magazine. Plotnick further notes the opposite is sometimes true, as well. Cats suffering from dehydration, for instance, sometimes have wet noses. 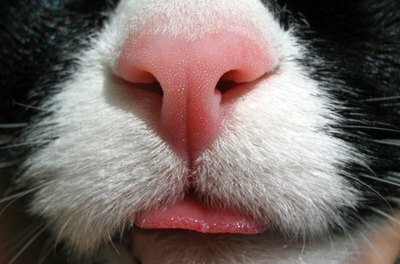 A cat's nose is usually cool, but it can warm up for several non-medical reasons. When a cat lies down in the sun or near a vent or heater, his nose heats up. Because it's on the tip of his face -- an extremity, like his ears -- it may be warmer than his body. "Remember that wet or dry noses are not a sign of illness per se," Dr. Adam Patterson, of Texas A&M's Veterinary Medicine & Biomedical Sciences program, explains. "Whether your pet's nose is dry or wet is largely related to the temperature and humidity in their environment." The absence of a cool, wet nose alone isn't reason to get concerned about your pet's health. A sudden change in nose temperature and moistness can tip you off to other signals, though. If your cat also shows other medical symptoms -- excessive thirst and urination, lethargy, decreased appetite, weight loss, vomiting or diarrhea, for instance -- call a veterinarian. Your cat may just have the feline equivalent of the common cold, but it could be something more serious. Your cat's nose may run from time to time. This can indicate anything from nothing at all to life-threatening respiratory issues. Is the discharge clear and watery? You're probably in the clear. Try reversing any recent environmental or food changes. If this has an affect, then it could allergies. Regardless, if the runny nose doesn't clear up in a few days, call a veterinarian. Is the discharge bubbly or discolored? Your cat may be sick. Call a veterinarian. CatChannel.com: Should a Cat's Nose Be Wet or Dry? Hills Pet: My Cat's Nose is Dry. Should I be Concerned? Dr. Kate Stenske, Kansas State University: What do You do When Your Cat Gets a Common Cold? Why Are Dogs' Noses Wet & Cold? Are Cats' Noses Supposed to Be Cold?